From the Euclidean box to the SmartCode, planners have a wide range of tools for shaping the form of cities and how they function. This practical report looks at six ways cities have adopted "form-based" zoning tools and the results that followed. 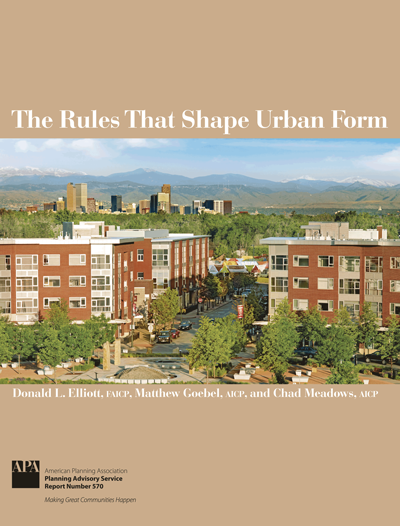 Case studies describe the pros, cons, and consequences of form-based zoning regulations in Austin, Texas; Mooresville, North Carolina; Denver; Arlington, Virginia; Livermore, California; and Miami. Interviews with planners in each community give real-world perspectives on choosing, implementing, and evaluating form controls. Because form doesn't exist in a vacuum, the report also looks at the planning challenges of housing affordability, carbon emissions, aging populations, and preservation. Which form controls support positive change in these areas — and which work against it? Lessons learned from cities across the country offer guidance for planners facing these challenges in their own communities.